Can we all agree on one thing? Nobody likes a proctology exam. I know. The thought turns my heart upside down, like the American Eagle wooden roller coaster at Six Flags and its gut-wrenching 360-degree helix. Welcome to an SQF audit. The acronym stands for Safe Quality Food and is facilitated by the Food Marketing Institute. According to the SQF Institute’s website, SQF audits are the “only scheme to integrate a quality component as well as food safety.” Scheme? I think they mean “scream” as in waking up in the middle of the night, sweating, trying to remember if you got that one guy’s signature on a form. As quality systems manager here at GreenSeed, this has actually happened to me. We had our audit in June. Officially, anyway. Here’s what I mean: Prepping for an SQF audit is an ongoing, yearlong practice. You must catch and correct little things – like a broken pallet on the floor – so they don’t become big things. There are reports and walkthroughs we do weekly, monthly, quarterly. We get confident by following the rules every day. If we don’t, they will be forgotten. This, more than anything else, haunts me – the risk of missing one small detail like not wearing smocks or hair nets the same way. Left unnoticed, small details become insurmountable safety issues. Two months before audit day, three to four people devote more than 200 hours on paperwork, nailing additional requirements, reviewing documents, updating signatures. Daily audits analyze the previous day’s work. This is where our best isn’t good enough. The new FSMA rules – PCQI – ensure that each critical control point for a contract packager is measured by a quality person. Every room has a 20-page deck of daily routines and requires two hours a day to verify. Still, what if we miss something? It’s a terrifying thought. 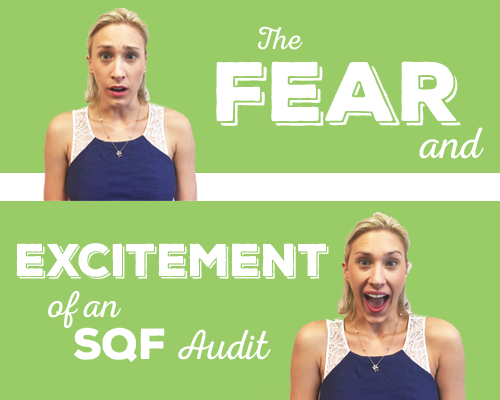 As you can see, a range of emotions surface at the very mention of an audit, but there is something that stands on the other side of fear: excitement. It’s exciting to see what you’re made of, to have an objective pair of eyes test your mettle. On the actual day of an audit, my work is done. Surprisingly, I’m calm as a cucumber. I wake up, grab a Jimmy Dean® breakfast sandwich or a candy bar and drive from St. Charles to Batavia like I’m going to a Cub’s game. Fear of the unknown is suddenly displaced with relief. You’ve done it all a hundred times. Even the tough questions, you know you’ve got. You know your facility is the best it can be. On audit day, you stand behind what you’ve built the previous year. You rely on that foundation, and you rely on the people who built it. It’s not, by any means, a walk in the park. We’ve had heated discussions on what fulfills a requirement and what doesn’t. But if a change needs to be made, we make it. Having a strong management team behind you is welcoming and comforting too. It’s another reason I sleep like a baby the night before the clipboard walks in the door. That was a great compliment because we are students first and experts second. We want to learn. When I started at GreenSeed in January of 2016, I had one version of quality – you look at the products you package and your customer. Now, I see quality is an intent to do good. You don’t just check quality off. You either have it or you don’t. Let’s say a code is blurry. You think: If this was my product, would I want it in the marketplace? As a defender of our customers’ brand, I’m never OK with mediocrity. And neither is anyone else here. Everybody on the floor is part of our quality department. It’s a teamwork mentality: empowering our associates working the line so every pouch has their name on it. When we hire someone, we welcome them into the company and our culture. They are part of something bigger. They are part of the product. And now for the big reveal. In 2016, we scored a 95 on the SQF audit. On June 29 of this year, we scored a 97. In closing, I have played sports my whole life – right through to my college days at Arizona State University. Now, I coach my son’s baseball team. It reminds me of how I regard quality. You have different attitudes, different intelligence levels, different educational backgrounds, different ways of looking at the world, and yet you instill fundamental rules in the way the game is approached. Everybody works toward the same goal. So when an audit is announced, you see what is on the other side of fear. You feel the excitement of exploring: How are we going to get better today? GreenSeed Contract Packaging is a Batavia, Ill.-based packaging operations company passionate about healthy foods and nutritional products. Contact the company at (630) 761-8544.